This delicious dish is from Viareggio on the Tuscan coast west of Lucca and Florence, and it deserves your attention. Sure, it may look like spaghetti with a fish sauce, but it is quintessentially, memorably Italian because it combines just a few ingredients into a dish that far exceeds its components. Secondly, a simple cooking technique called 'Pasta a Risotto' enhances this dish remarkably, and will help you become a better cook for the rest of time. Thirdly, and never least, it celebrates the pasta! Viareggio is the original resort city on the coast of Tuscany and it has a distinguished past, though short by Italian standards. It was the only seaport of the Republic of Lucca, but remained a small town until tourism began in the latter half of the 19th century. The fishing fleet here dates 'only' from 1770 and has always been dependent on fishermen from other regions. Originally the fishermen were Ligurians, and, at other times, Sicilian and Calabresi. 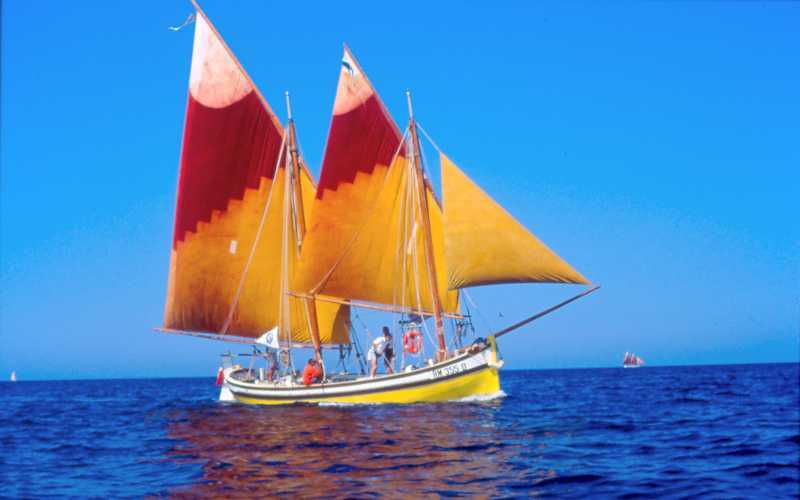 In the early 1900's fishermen from San Benedetto del Tronto, on the Adriatic Sea in the Marche region, began to settle in Viareggio using a picturesque sailing ship called 'trabaccolo'. Their numbers increased further in the period of recession between the World Wars. According to current folklore, Spaghetti alla Trabaccolara originated with these Adriatic fisherman. The fish used were those 'fish leftovers' (avanzi del pesce) which didn't sell in the fish market. This variability is a fetching attribute, insuring that the result is different every time. Now the dish has become a Tuscan point of pride, and is offered at many restaurants in and near Viareggio, It is easy to doubt the origin stories, but we think that Spaghetti alla Trabaccolara shows the wonderful adaptability of Italian cooking, whatever the genesis. Small Trabaccolo used as a pleasure boat. Pasta a Risotto. This method of cooking dried pasta, along with many variations, has been used in some traditional recipes and in restaurant cooking for generations, but it is not as well known as it should be. The spaghetti is cooked for just two minutes, then drained. The pasta is then finished in a frying pan, with liquid added in ladlefuls, and stirred like a risotto to complete the cooking. This is called 'Pasta a risotto' and it infuses the spaghetti with the sauce/broth flavors, as well as giving the spaghetti a wonderful texture. Be sure to remember this technique for Spaghetti alle Vongole (with clams) or Spaghetti ai Muscoli (with mussels). ½ pound, more or less, chopped mixed fish and shellfish, see below. 3 or 4 cups of fish broth heated to a good simmer, OR reserved pasta water. 1. In a large pot, put enough water to cook the spaghetti, and bring it to a boil. 2. In a frying pan, heat the oil, and add the parsely, garlic, onion, and hot peppers. Cook until the onion and garlic have softened, then add in the chopped tomatoes. When the tomatoes start to dry out, add the wine. Heat until the wine is evaporated entirely. While the wine is cooking down, salt the water you have boiled and add in the pasta. You should cook it about two minutes, then drain it - saving the liquid unless you're using fish broth. Back at the frying pan, add in the fish. Try to cook it quickly, so that it is pan fried rather than boiled, and mash it lightly with a fork. When the fish has turned white, add the pasta you’ve just cooked for 2 minutes to the frying pan. It should bend just enough to fit in! 3. Finish the cooking by adding liquid by generous ladlefulls to the frying pan mixture and stirring fairly constantly. If you have the fish broth, use that. If not, use the water the spaghetti was cooked in. When the pasta is done to your taste, and the small amount of liquid in the pan is just a bit creamy looking, sprinkle with parsley and serve. The fish was deboned and chopped into pieces of about 1/2 to 3/4 of an inch square. What is Mixed Fish? If you are simpatico with the nature of this dish, it will be different every time as the fisherman takes what the sea will give. We are mentioning specific fish types to encourage you, but there are no rules! In addition to the traditional humble varieties of fish, modern adaptations of the 'original' preparation often add some shrimp, and/or some calamari for some richness, but if you get too enthusiastic, then you've made a variant of Spaghetti allo Scoglio. We've had it in a Viareggio restaurant where some salmon was added, and it was pretty good, even though that's not a fish a Viareggio fisherman could catch. Italian recipes almost always mention gallinella and triglia, which are easy to find in Italy. Scorfano is also a suitable addition, but have your fishmonger debone it. Other types mentioned in Italian recipes are naselli, tracine, and gattucci. 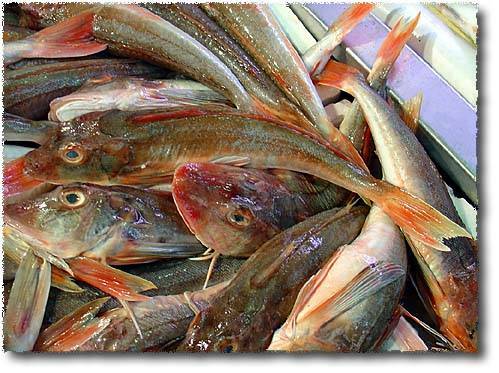 The English name of Gallinella is tub gurnard, and may well be found in Britain. Triglia is called red mullet and is available in Britain. Naselli is the European hake. Scorfano is indispensable in the brodetto of the Adriatic and it's the famous rascasse of bouillabaisse. It's called sculpin in English, and while it is a large, varied worldwide family, the bony bait-stealer is probably not marketed in most places. 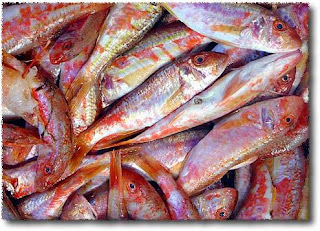 Other fish more easily found that we wouldn't hesitate to add to the mix are ground fish (cod, hake, pollock, haddock) ocean perch, red snapper, monkfish, and goosefish. The texture of the fish is not an important part of the dish, so frozen fish will work well. Pasta For this dish, the quality of the spaghetti is important. Properly prepared, you will find that the dish is much better with a high-quality spaghetti. This is especially true with the 'pasta a risotto' technique, which optimizes the texture. The best dried pasta is made with hard durum wheat, which Italians sometimes call 'Manitoba'. It will have a mild wheaty taste which lasts throughout the bite. It will retain its bitey texture to make your chewing experience sublime throughout your meal. It will create a subtle creamy aura around itself which will enhance the sauce. That said, quality pasta is whatever you enjoy. In our opinion, 'Martelli' brand in the bright yellow package is the gold standard, but it comes extra long and you'll have to break it for your pan. We like 'Lucio Garofalo' brand from Naples, which can be found in both Italy and the US. The 'DeCecco' and 'Delverde' brands are good, also widely distributed. 'Barilla' brand in Italy is acceptable, but in the US, we think it's a bit soft for this dish (sorry Kansas). We hasten to add, we happily eat tons of 'Barilla' US in other dishes. Scorfano Deboning (IT) Simple Italian site with photos of preparing and deboning a scorfano / sculpin. Pasta a Risotto A nice piece on Memorie di Angelina about the risotto technique on small pasta. Pasta a Risotto (IT) An Italian blog about the risotto technique on spaghetti as used by noted Italian chef Allan Bay. Kyle Phillips About.com Good information on buying and using Italian fish.